There are many occasions in ones life where you just can’t wait for the days to pass by and you watch every day go by, crossing it off one after the other in anticipation of some ‘big’ day. This big day might be a major event in the family like a wedding or family vacation, or maybe a birthday or winter vacations or something like that. The problem with staring at the calendar counting the days left is that that particular activity would make the time pass even slower. You know how they say ‘a watched phone never rings’. It’s pretty much the same concept. Besides it can be annoying and messy to cross those days off on a calendar so why don’t you allow your android device to help you with this stuff? 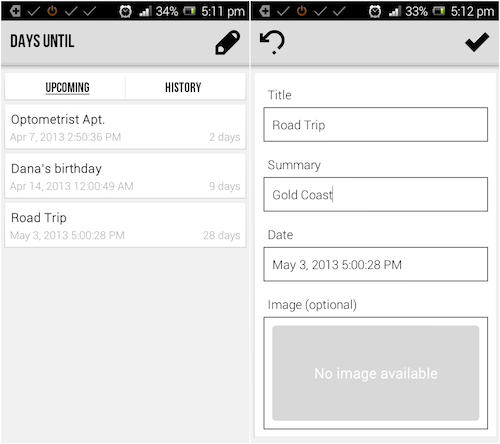 Days Until is an application that would serve that purpose and it was developed by a member of the famous forums, XDA. It is a very simple to use application that will allow you to count down the days until – just like the name says. It is very logical, the interface and clean too. There are four main components that you will come across when you access the application. The first screen is a list of upcoming events. This screen would list down all the upcoming events that you already set. If you press on a certain event, it would take you to a second screen which will display the time left before that event is supposed to happen which would include days, hours, minutes, and seconds. You can even share the events if you need to. The third component of the application is where you create the events. All you have to do is give the event a name, add some notes and tags if you want and specify exactly when the event is supposed to happen. The last component and the final one is the history tab and obviously that stores all the events that you stored and have passed. In the event where the countdown is over, you will have a notification in the notification are of your Android. This application is extremely simple and straightforward to use. It is fast, neat and does what it is supposed to do flawlessly. The application is available for free on the Google Play Store and is compatible with all the Android devices operating OS version 2.2 and above. Let us know what you think about it in the comments.